Joseph Brent - Faculty Member, Mannes College The New School For Music. Joe Brent is not the one to ever give up on a good idea. Years ago, while attending Carlo Aonzo's Mandolin Workshop in New York, I sat next to a young man who stood head and shoulders above everyone else as a mandolinist. Not only could he play up a storm, but his contagious smile and good cheer spread all around the room. By the second or third session, he introduced himself and asked me whether I would write something for him. Without any hesitation, I gladly agreed; knowing, however, that I had other projects stretching two, three years out, I cautiously qualified my offer with "eventually." So I put that good idea in the back burner. At next year's workshop, Joe reminded me; the year after, he reminded me again. The end result of his gentle persistence was my Antwerp Harbor, one of the works that are nearest and dearest to me. Our paths crossed again at Mannes College of Music, where I worked at the time. Joe came in with every intention of pursuing a graduate program in interpretation. The faculty were mightily impressed by his mandolin playing, and quite smitten with his charming personality. The only trouble was... there was no mandolin program, no such degree, no such curriculum! What to do? Through the subtle powers of diplomatic suasion, they gradually came around to a momentous epiphany: if there was no mandolin program as of yet, why not start one? And so it came to be. Joe is now the first and only mandolinist in the United States to hold a conservatory position as an instructor specifically of classical mandolin. History has been made, so to speak, and Joe has earned his place on the firmament both by his skills and his winning ways. The future looks bright. Joseph Brent playing Summertime Clothes from his 2011 EP Joseph Brent Solo. On September 9, 2009 while under construction. Photo credit: Brian N. Dean. Mandolin Cafe: Your Brian N. Dean Grand Concert mandolin is a sight to behold, a healthy step away from traditional mandolin shapes. In addition to being a beautiful instrument, it's extremely responsive and sounds fantastic in your hands. What's the story behind what you were looking for in an instrument — sound and style — and how did you select Brian as the creator? Joseph Brent: Thanks for the kind words! Brian is one of the most original thinkers, regardless of profession, I've ever met. He's just on a whole other wavelength from any other luthier. He's got that mix of chops, raw talent, and fearlessness that attracts me to any creative person. Those are the kind of people that I really like — someone with not only the technique and craftsmanship at the highest level, but who is also willing to throw all the rules out the window and try for something really new. 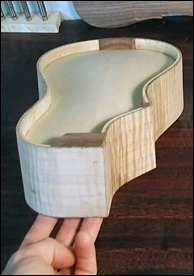 In the mandolin world, you have either the American-style flatback instruments, which were designed for musicians living 100 years ago, or the bowlback instruments, which were designed for musicians living almost 300 years ago. That music doesn't exist anymore, the venues they were designed to be played in don't exist anymore, and all those musicians are all long dead. I'm convinced that if (as Darol Anger would say) Lloyd Loar was alive today, he'd say, "Jeez, you guys are still doing this?" If you're playing Vivaldi in an orphanage, then by all means, get yourself a Vinaccia. Or if you're playing Camptown Races with your local mandolin orchestra, then sure, get yourself a Gibson. That's not what I do, and I needed an instrument designed for the music I play and the venues I play in, and I know there are lots of musicians like me who would love the chance to create an instrument that's more geared to the music they're making. I'm just the only S.O.B. lucky enough to have met Brian. We first met in Montreal in 2007 at the CMSA convention. He was showing off some Embergher models he had just made, but he was also rocking some crazy goth threads, and he just looked totally out of place, like a tire fire on Izod Alley. So I was like, "That's the guy I want to hang out with." And he was totally brilliant. We talked about music, and instrument making, and lots of other things, and he was just completely out there, in a really great way. So we decided to work together on this instrument. I sent him MP3s of players I liked, with a bit of info about what I liked in their tone or what I didn't like, and I gave him a few guidelines that would make no sense to most people, but to a wood scientist, luthier, and artist like him, I knew he'd be able to decipher my meaning. Stuff like, "I want to hear the wood, and not the metal." And, "I want it big and dark and loud, like the engine note on a Ford GT." There were a few other specific things, like I wanted to be able to play it standing up with a strap, and I wanted 27 frets like the Pandini I was playing at the time. We also had the same idea for the built-in tone guard it has, with the false back/true back thing. All that in his mind translated to the futuristic shape, the wood combination (walnut top, maple sides/false back, spruce true back), and the extreme dimensions (14.25" scale). And he just totally hit it out of the park. It's got a lot of crazy features, like that aforementioned false back, but also a zero fret, which lots of luthiers stay away from because they're associated with cheap, factory instruments, even though they're actually a really good idea. It has f-holes that extend over the sides of the instrument, so some of the sound comes up to your ears as you're playing and gives you a better idea of how you're balancing in the ensemble. It's also got a pick guard set into the top of the instrument rather than rattling around above it. The cutaway freaks people out a bit, because everyone is so used to having their hand stop at the 12th fret when shifting into the higher positions that standard mandolin technique adapted to accommodate it. The GC cutaway slopes in much more deeply, and doesn't really catch your hand until you get up to the 16th or 17th fret. It makes it easier to reach and move around in the higher positions, but when a lot of players try it they don't know what to do with themselves when their hand goes flying past the 12th, so they freak out a little bit. It takes a bit of playing to get used to, but it eventually feels like you've got all this extra space for your hand to move around in. It's amazing, especially considering Brian doesn't even really play the mandolin, that he was able to intuit that bit of design. Or maybe it's because he doesn't play, and so he wasn't held back by any preconceived assumptions about what a mandolin is supposed to be shaped like, and all that stuff. And the sound of it... mamma mia. It really does sound like a '69 Chevy with a 396, fuelie heads and a Hurst on the floor. Bruce would love it. Joseph Brent's Grand Concert Mandolin built by Brian N. Dean, nicknamed "Pähkinä." Photo credit: Brian N. Dean. Builder's comments: "Joe's mandolin was simply a prototype that happened to grow wings. I was nervous as hell sending it to him at first; he had provided a list of requirements — things that the mandolin should do and preferences of what it sound like. There was not a single visual requirement, only that it perform, and this lent to the serious nature of the build." Mandolin Cafe: Tell to us about your approach to the music you've performed and recorded. You obviously have a passion for composing and a varied background in classical music, but you also are playing and recording some popular music, performing with a vocalist, a quartet and traveling extensively in the process. You seem to be a part of a new school of mandolinists willing and capable of traveling in different musical circles. Joseph Brent: My background is definitely in classical music and jazz improvisation, but my concerts don't have a lot of classical or jazz music in them. My solo shows have a lot of original stuff, music that's been written for me by composers I like, or arrangements of music I like, usually by bands like Animal Collective, TV On the Radio, Secret Machines, The Flaming Lips, etc. I'm always working on new stuff. I have a quartet that plays my own music and arrangements, with bass, guitar, and clarinet, but we're all so busy working on our own projects that it's hard for us to play together as often as I'd like. I do a lot of recording. I also play with pop artists like Regina Spektor and Jewel, and a multitude of bands in the New York area. 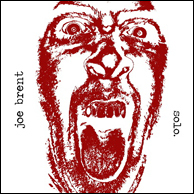 Joseph Brent Solo, EP, 2011. Click to purchase. There's a wonderful scene of musicians here that I'm a part of, to the point where a lot of bands are interchangeable, like on one night, me and two other guys might be playing behind one singer/songwriter, and the next night, the same guys will be with a different singer playing different songs in a totally different style. Sometimes even on different instruments. The trick is to find musicians versatile enough that you can do that, and luckily there are a lot of players like that here in New York. The schizophrenic nature of the New York music scene really appeals to me. I don't know how classical players can keep playing the same repertoire year after year. That's not music, that's choreography. At that point, it's just a sequence of fingerings you've memorized, like dialing a telephone number, and then you sit back and wait for people to be impressed by how fast you can dial. That never impressed me. For me, virtuosity is the technical ability to make the music you hear in your head, whatever that music is. It's easy to think of Jimi Hendrix as a virtuoso, but would you say the same about a player like Marc Ribot? He hears things that nobody else hears. You can hear a few notes of his playing and know it's him. It might be a different conception of virtuosity, but the result is the same: the music they make (made) could only have been made by them. That's the kind of virtuosity I'm striving for. I can hear all this amazing music in my head, and all the technique, the hours of practice, all that hard work, it's all to make that music in my head come out into the world. I've studied Calace and Bach and I love classical music, and when I do play it, I put everything I have into it, and I'm fulfilled by it. You can't really say you understand the instrument until you have a thorough grounding in its technique, history and repertoire, and I make all my students study Calace and Bach and the major repertoire for the instrument. But I also put everything I have into the John Prine song I recorded last night, and was equally fulfilled by it. If I had to play the same Calace Prelude over and over again for a living, I'd just as soon get a job. Mandolin Cafe: You graduated from Berklee College of Music in the late 90s. They didn't have a defined mandolin program at that time. What was that experience like? Joseph Brent: I had a wonderful time at Berklee. When I went there, the string department was nothing like it is now, I think only 10 students. But Matt Glaser did a great job promoting it with the summer programs there and now it's grown into one of the biggest departments in the school. The good part about the string department when I was there was because there were so few of us, we all got very close. I was there with K Ishibashi, who was in Regina's band before me and now plays with Of Montreal, and we're still really good friends. Evan Price, formerly of the Turtle Island Quartet was there, as well as Ludvig Girdland, a great Swedish improvising violinist; Carrie Rodriguez, a fiddler who is doing really well as a singer-songwriter; Hanneke Cassel, one of the world's great Cape Breton fiddlers; Rushad Eggleston, a founding member of Crooked Still; and of course my dear friend Dan Cho, who played cello with Regina, Katy Perry, Coldplay, John Mayer, and many others. We saw each other every day in classes, and because there were so few of us we were very popular with students who had recording projects or especially film scoring sessions, so we worked together just about every day as well. We formed really close bonds, and we continue to make music together occasionally, and I love rooting for them and seeing them succeed out in the music world. And because we were together so often, the bad times hit us all the harder as well. Ludvig was in a car accident a few years ago and is still having a difficult recovery, and Dan died tragically last year while out on tour with Regina. When all that happened, it was nice to have that Berklee community all over the world to close ranks and support each other. The other great thing about Berklee, which is as true today as it was when I was there, is that it's a situation you can never replicate in the real world. There's 3,000+ students there, mostly international, and everyone's got their own thing, their own musical direction they're pursuing, so you can get swept up in it and experience all these different kinds of music in a way that you can never really do again once you're out in the real world. I like to tell prospective students that they should absolutely be learning more from their fellow students than they are in their classes or lessons. They should take advantage of having all these amazing musicians around them, and play Portuguese fado on Monday, jazz on Tuesday, Andalusian folk music on Wednesday, Japanese gagaku on Thursday... really soak all that up, and don't just live in the practice room. Teaching at a conservatory here in New York, I try to get my students to experience something akin to that, by pointing out all the amazing stuff that happens every day in this city, which you can't experience anywhere else. All of that should be part of a musician's education, and I definitely got it at Berklee. On tour with pop star Regina Spektor. L-R: Yoed Nir (cello), Regina Spektor, David Heilman (drums), Joseph Brent (mandolin, violin). Photo taken in the Jardín Japonés, Buenos Aires, Argentina. Mandolin Cafe: What is your role at Mannes? Joseph Brent: I teach mandolin at Mannes, a music conservatory in New York that's part of The New School, to students of the school proper, and through the Extension Division, which offers conservatory-level instruction to anyone, not just students enrolled at Mannes. Most of my students are through the extension school, in fact. And I have a Skype station, which enables me to teach students all over the world who want to study with me. 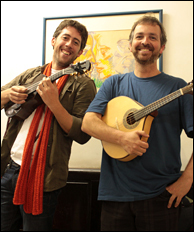 I believe, in fact, that we were the first to offer Skype lessons to the mandolin community. I see lots of people are doing it now, and that's great! That can only improve the level of mandolin pedagogy available to talented students worldwide. 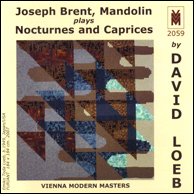 Mandolin Cafe: Your newest project, Joseph Brent Plays Nocturnes and Caprices by David Loeb, is an ambitious project of mostly solo material, and much of it quite challenging. What was it about his material that drew you to it? Joseph Brent: David is a really fascinating guy. He lives part of the year in Japan, and has an equal grounding in Japanese idioms as he does in Western music, and you can hear a lot of that influence in his own music. It's spare, and definitely modern, but very accessible as well. It's not easy to play by any means, but he's like me, in that he's not a guy who's impressed by pyrotechnics. Where it does get technical, it's only once it's earned it by building up to it logically and organically. Joseph Brent, Mandolin Plays Nocturnes and Caprices by David Loeb, 2011. Click to purchase. He approached me after talking to a student of mine who was a composition major studying with him, and mentioned that he had a set of solo mandolin caprices he had written awhile back for a Japanese player that had never actually been played, so I premiered them here on my faculty recital two years ago. It was a bit of a hit, so we decided to turn it into a CD-length project involving more caprices, but also duets with a few other instruments. We agreed that it was better to work with individual players we admired, rather than writing for an instrumental combination and then trying to find someone who could hack the part. Miranda Cuckson was the first name we discussed. We are both big fans of her playing — she's unquestionably my favorite violinist in New York. She's completely fearless as a musician, and nobody plays with as much soul or dedication. Next, I mentioned my friend Oren Fader, a guitar professor at the Manhattan School of Music with whom I've worked many times, and who I've always loved as a musician and all-around great guy. Finally, to round out the textures, David suggested a wind duet, and I knew it had to be Josh Rubin, who I've known for many years through the International Contemporary Ensemble. Everything fell into place beautifully, David wrote some extraordinary music for us, and Miranda, Oren, and Josh play amazingly. I couldn't be more proud of what we were able to accomplish together. Joseph Brent playing Nocturne for Guitar and Mandolin with Oren Fader on guitar from Joseph Brent Plays Nocturnes and Caprices by David Loeb. Mandolin Cafe: You're working in an area of lower Manhattan where a short cab ride might easily take you to a Chris Thile, Andy Statman or Aaron Weinstein performance. Yet, in what I've been able to pick up from musicians in the city, most of you haven't met. Is that correct? Joseph Brent: Not really. I know Aaron a little, from running in some similar scenes, and better now that we did the CMSA convention together last month. He's hilarious, and a terrific musician. I've seen Andy a few times at Banjo Jim's and Jalopy, which are venues in NYC we both play at a lot. I've also been a great admirer of his playing since our mutual friend Matt Glaser hipped me to him while I was at Berklee. I don't really know Chris personally all that well, though of course I know his music and we also run in a lot of the same extended circles. I'll never forget the time I played some Punch Brothers for Alon Sariel in my car, and he gushed, "That's what a mandolin is supposed to sound like!" New York is like that though. Here, you can have a very close friend that you may only see once every few weeks, or even months. One of my best friends in the world lives 20 blocks away, but he's a guitarist in a Broadway show and I'm out playing my own stuff all over the place, so our correspondence is oftentimes limited to snarky text messages, or chop busting when his football team loses. Everybody's got their own thing, and especially amongst musicians like us who are out of town pretty frequently, there's just so much going on that you tend to form lots of interconnecting relationships and friendships, rather than just a few close ones. I'd love to get to know all of those guys better. There are so many great players out there I haven't met yet that I'd really love to. I'm a massive fan of Sierra Hull, Hamilton de Holanda, Sarah Jarosz, and Adam Steffey (my all-time favorite mandolinist! ), but I haven't met any of them yet although they all come through New York from time to time. Just in the past few years, I hung out with (among many others) Paulo Sá in Rio de Janeiro, Caterina Lichtenberg in Düsseldorf, and Keizo Ishibashi in Baltimore, and it was our love of the mandolin that brought us all together. How cool is that!? Maybe it's easier to meet up with players that way than to take a cab ride. Joseph Brent supporting Jewel performing Only Shadows on LIVE! with Regis & Kelly, October 12, 2011. 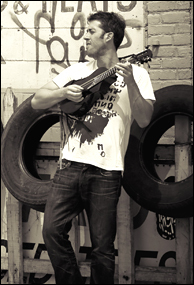 Mandolin Cafe: You have a close friendship with Israel's classical mandolin great Avi Avital. How did that friendship come about? The interview featuring him that you did for us last year was terrific. Joseph Brent: Avi! Yeah, he's awesome. I'm over the moon about his Grammy nomination and Deutsche Grammophon contract. We knew of each other and had corresponded a few times before we ever met, and we both had worked with Bridget Kibbey, the amazing harpist I did my first CD with and still play with a lot. Then when we finally met, we got on really great. He's into a lot of the same things I'm into, which I guess would be new music for the mandolin, or pushing the boundaries of what the instrument is supposed to be able to do. We both have a very healthy disdain for mandolin orthodoxy, whether that be in technique, repertoire, or attitude. Neither of us has any time for anyone who says there's a 'correct' or 'incorrect' way to make music. Unfortunately, there are a lot of fossils out there in the classical mandolin world, and our shared frustration with that led to beers, a lot of joyous music making, and a great friendship. Mandolin Cafe: With the Loeb project now published are you looking ahead at a new recording? Joseph Brent: Always. Just finished recording albums with Justin King, Adam Rhodes, Rory Sullivan, and Bryan Dunn, and I have recording projects coming up with Kelli Rae Powell and Danica Dora. With Bryan, we did the full-length album, and then as a present to his Kickstarter donors we also recorded bluegrass versions of six 80's tunes and put it on an EP. I just released my own EP of the rock band arrangements, including an Animal Collective tune, two Flaming Lips tunes, and one by my friend Dan Cho. I'd love to record with the quartet sometime in the next year or two; we do a version of Piazzolla's Suite Troileana that'll knock your socks off. Professor Loeb actually just finished a mandolin concerto for me, that will get premiered sometime next year and perhaps we'll record that as well. There's a bunch of new stuff I'm writing that's in the pipeline. I can't wait to finish it so I can work it into the program on recitals. 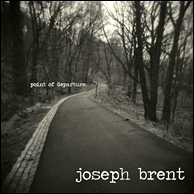 Joseph Brent - Point of Departure, 2008. Click to purchase. Instrument/Case: Brian N. Dean #64 Grand Concert Mandolin, nicknamed "Pähkinä," ProTec viola case modified to fit the Grand Concert and look like a Bugatti Veyron. Picks: Wegen Bluegrass picks have the best tone, and are what I prefer to record with, but if I'm playing music that's highly technical and needs a bit more clarity, I also have a bunch of Blue Chip TAD60s, some with a round bevel and others with the 'speed' bevel. I should note that strings and picks are totally dependent on the instrument they're matched with, and the players' personal preference, so none of this should be construed as an endorsement of one pick/string or another. It's just what I prefer and what I think sounds good with Pähkinä. Microphone preferences: In studio, ribbons. The Coles 4038 is the best mandolin mic in the world. The Royer 121 is also very good. For live performances, only a Schoeps MK4/CMC 6G will do. I sometimes do gigs where I use a heavily modified signal (pedals, effects, etc), and for that I use a John Pearse pickup and feed it through a Tonebone PZ-Pre and a Zoom Acoustic Effects pedal, then all kinds of vintage and bizarro doo-dads, usually including my customized Ibanez TS-9, Danelectro Rocky Road, and a Boss OC-2, but I have a closet full of gadgets and gizmos. I also have an old Crafter electric mandolin for really wacky stuff, usually backing tracks in studio and modded noise-making, never for something where I'd actually want it to sound like a mandolin. What I think I see and hear in Joseph Brent is an evolution, of sorts, in the human condition. The old model, highly egocentric, is shifting toward something more inclusive and cooperative much like the leaderless "Occupy" movement going on now. The time honored ethic of music, namely inspiration, mystical searching, expressing the inexpressible, raising spirits of compassion, grief, love and understanding seems to be implied in Joseph's emphasis of playing with heart and passion with whatever tools one has at the moment. Playing fast or just the right notes is overrated. I glad to see this unfolding because, heaven knows, our World is truly on the ropes on so many fronts. Great Interview! He is one of the reasons my son decided to enroll in Mannes College to study music. Noting the anniversary of our interview with this fine mandolin player! Another interview celebrating a birthday, from 2011. Thanks for the bump - that was a great interview, and quite an interesting mandolin. BTW, I saw a number of fine Dean mandolins at the CMSA convention, quite excellent workmanship. Joe Brent regularly does interviews and features for 21cm.org, a web magazine from DePauw University which has a lot of interesting musical content and unique points of view. The link below has his articles.